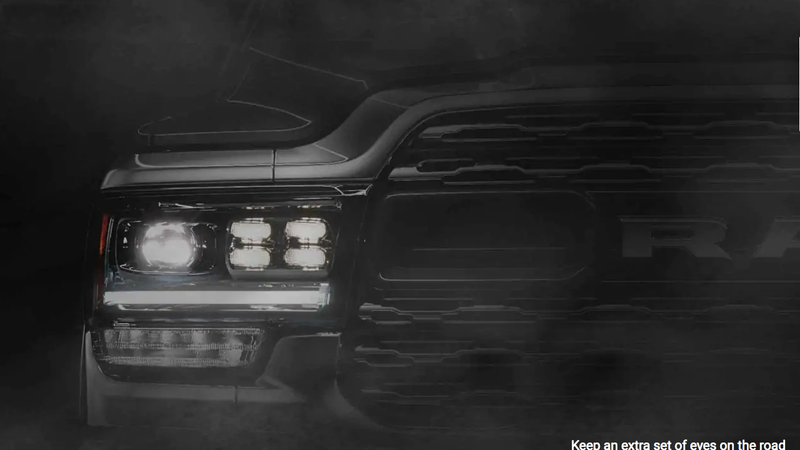 Prior to unveiling the new Ram 2500 and 3500 at the Detroit Auto Show on Jan. 14, Ram launched a web page that features the teaser image you see above. It is dark and smoky, and I think we’re all supposed to be scared that this thing will consume us whole. I kinda am. Heavy duty trucks aren’t messing around lately. The teaser page is filled with a bunch of random “inspirational” images, most of which really have very little to do with the truck. But the image above, apparently meant to highlight the truck’s headlights, does give us a decent glimpse of the front end. Why does there appear to be smoke or steam in the air? Does the truck vape? Is it overheating? To these, I have no answers. But I can tell you that this front end—especially that stepped headlight with the four mini projectors, and also the oval-ish hole to the left of the RAM symbol—looks a lot like the front on a bunch of Rams that have been photographed around Michigan in the last few months. You can check out those spy shots on Truck Trend. The new Ram 1500 debuted in Detroit last year, so it’s time for Ram to show a heavy duty version with styling a bit closer to that of the new half-ton. As for what’s going to be under the hood, we don’t known yet, but Chevy’s got 910 lb-ft of torque to compete with, so we’ll see what Cummins managed. One area in which it doesn’t appear the Ram will compete with the Silverado is in front end styling wackiness. The Silverado HD’s face, at least in some trims, is just out there, whereas these Ram teasers and spy shots seem a lot more restrained. We’ll see it in the flesh soon enough, and decide how true that is.